This article is about the film. For the soundtrack to the film, see Above the Rim (soundtrack). For the unrelated song by Bell Biv DeVoe, see Above the Rim (song). Above the Rim is a 1994 American sports film co-written, storied and directed by Jeff Pollack in his directorial debut. The screenplay was written by Barry Michael Cooper, from a story by Benny Medina. The film stars Duane Martin, Tupac Shakur, Leon Robinson, Marlon Wayans and Wood Harris. The film tells the story of a promising New York City high school basketball star and his relationships with two people; one a drug dealer and the other a former basketball star now employed as a security guard at the high school, where he was the promising young star years ago. The movie was shot in Harlem with various scenes in the movie filmed at the Manhattan Center for Science and Mathematics in East Harlem. Some of the basketball scenes were filmed at Samuel J. Tilden High School in Brooklyn, NY. Kyle Watson is a talented basketball player who is about to graduate from high school. While he waits to find out if he will receive a scholarship to Georgetown University, he finds himself in a difficult dilemma over a playground basketball tournament. He must decide whether to play for and follow his widely beloved basketball coach Mike Rollins, or Birdie, a local thug in the neighborhood. Thomas "Shep" Sheppard, a former standout player himself, now works as a high school security guard. Kyle feels resentment towards the security guard, because Kyle's own mother is falling in love with Shep. Coincidentally, Kyle's coach also wants Shep to coach his team when he feels it is time for him to retire. It is later revealed to Kyle that Shep is Birdie's older brother. Kyle makes a decision to run with Birdie's team until he decided to come back to his old team, because of Birdie's wrongful actions against Flip and Kyle's friend Bugaloo. In the tournament, both Kyle's and Birdie's teams march to the finals, with Kyle's team playing solid team basketball, while Birdie's team plays a very thuggish style. Before the finals, Birdie threatens Kyle, demanding Kyle to throw away the game, so that Birdie's team would win. Kyle is brutalized throughout the game, with Birdie's team having a solid lead, and is injured. Shep, unable to watch anylonger, replaces Kyle in the game - despite being aggressively attacked throughout, Shep helps the team come back, and in the final seconds, passes the ball to Kyle, who hits the game winner. After the loss, Birdie orders Motaw, his star player and gang member, to kill Kyle. Shep protects Kyle and is shot, while Motaw is shot dead by security. Birdie is later killed by Bugaloo as revenge for previous humiliations. In the end, Kyle is revealed to have gotten the scholarship to Georgetown University - during a televised game, Kyle hits the game winner, while a recovered Shep watches with a smile. Duane Martin as Kyle Lee Watson, a talented basketball player who is determined to be accepted to Georgetown University, to play for their basketball team. He is seen as cocky and hot tempered but later changes his ways during the course of the film. Leon Robinson as Thomas "Shep" Sheppard, a quiet, bitter, introvert who used to be an incredible high school basketball player. He was later arrested after his best friend, Nutso, accidentally jumps off a high rise building while playing basketball. Tupac Shakur as Birdie, the local drug dealer and the film's antagonist. He is Shep's younger brother who secretly wants Shep to join him in his illegal empire. He later bribes Kyle to play for his team. Marlon Wayans as Bugaloo, Kyle's womanizing yet goofy best friend who spent a year in juvenille detention for an unknown crime. He is often bullied by Birdie and his gang members. Bernie Mac as Flip Johnson, a crack addicted homeless man who used to play basketball alongside Shep in high school. He is occasionally harassed by Kyle, Bugaloo and Motaw. David Bailey as Mike Rollins, a respected coach for coaches for Kyle's team, and tries to get Shep to play basketball again. Tonya Pinkins as Mailika Watson, Kyle's mom who tries to get him to see that there is more to life than just basketball. She develops a relationship with Shep. Wood Harris as Motaw, Birdie's teenaged lieutenant and star player on his team. He is a homicidal psychopath who will kill anyone with no second thought nor remorse. Shawn Michael Howard as Bobby, Kyle's shy and soft-spoken friend who plays in the basketball tournament. Henry Simmons as Starnes, Kyle's teammate who is disgusted by Kyle's cockiness. The movie was filmed in 1993. Allen Payne was the original choice to portray Kyle Watson, but was rejected by Pollack in favor of Duane Martin. The film was released on March 23, 1994, grossing $3,738,800 on opening weekend. At the end of its theatrical run, it had grossed a total of $16,192,320. It holds a 53% rating on Rotten Tomatoes, based on 19 reviews. Peter Travers stated "It's Shakur who steals the show. The rapper's offscreen legal problems are well known, but there's no denying his power as an actor." Variety said "A fine cast and the movie's general energy can't overcome that mix of cliches and technical flaws, which should conspire to prevent any high flying at the box office." ^ "Above the Rim". Box Office Mojo. ^ a b Maslin, Janet (March 23, 1994). 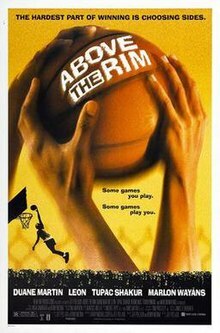 "Above the Rim (1994) Review/Film; A Young Man Torn by Good and Bad". The New York Times.